I got Star Struck top done late on New Years Eve. I asked you last week what boarder I should use. I also took the quilt over to my mom's and asked her for help. 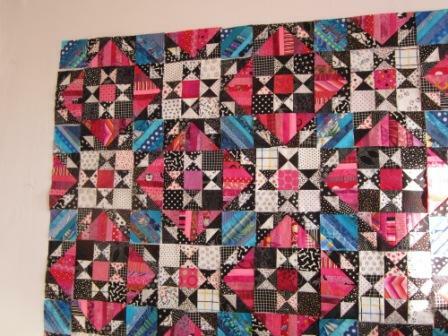 She is a very good quilter and level 3 judge with the Canadian Quilter's Association. I knew the answer before she told me. The pin wheels were too small in scale. They were smaller than the other units in the body and the scale was not going to work. So rather than fuss with more bigger units I decided to simply put the Dark Blue boarder on my quilt. I had never planned to make this a extra hard or fancy. I just wanted to do some simple patchwork and make a quilt for the living room. I started this on Nov 1st when Bonnie Hunter said she was going to do the mystery starting Nov 19. I could not wait I had to start something, so her Star Struck pattern it was. 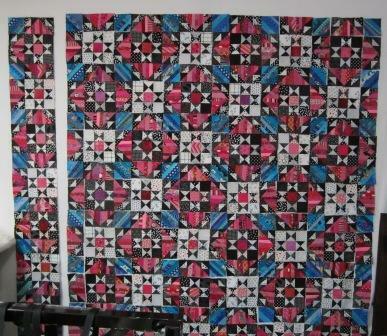 Now to add it to the pile of flimsies that need quilting ( build a backing too). Not sure when I will get it quilted. I have others in the line up. 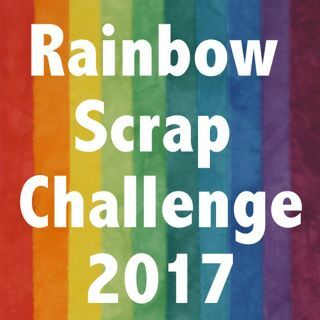 I am posting this to Patchwork Times Design Wall Monday. Orca Bay Mystery is on the way. I have been able to keep up. It has driven me to sew more these past few weeks. The top photo is in the sunlight and has better colour, the photo below is at night and only the room lights but it shows more and the one row set done. The row sewing is slow but I am happy with how it is going together. I was very worried about the black geese parts giving me trouble. There is stretch and give every were in the blocks. So many pieces and so heavy. It will be lovely when done. My Mom has been working hard on her quilt. She was away at the start and is trying to get caught up. She is on step 5 - this was the hardest part to keep going for me. I am not sure how my other local quilt friends are doing on the mystery. I have not seen too many photos on face book the past week or two. My Auntie posted photos of her's last night on her blog. Check out the different colours she is using Here. To see more still, check out Bonnie Hunter's Linky thing . How cool that you have family members that quilt too. I knew that your mom did but did not know that you had an auntie that does too. 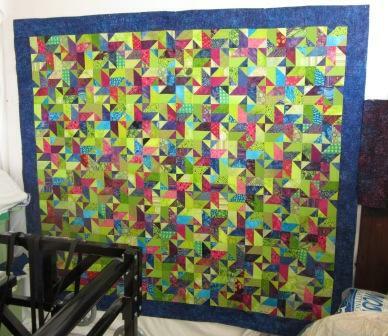 It must make for some fun times talking and sharing the quilting experience. This Orca bay mystery is turning out beautifully.. I too am having problems and worry about the string geese. These rows with the Geese and string squares are longer than the Ohio Star/ geese rows. Your quilt is wonderful! I love it. Your quilt is beautiful - I am glad that you got your quilting mojo back! Cathy, it is just gorgeous, those white stars jump right out at you. Great job. It's looking great! It makes me excited to see mine take shape, because I'm still a few steps away.